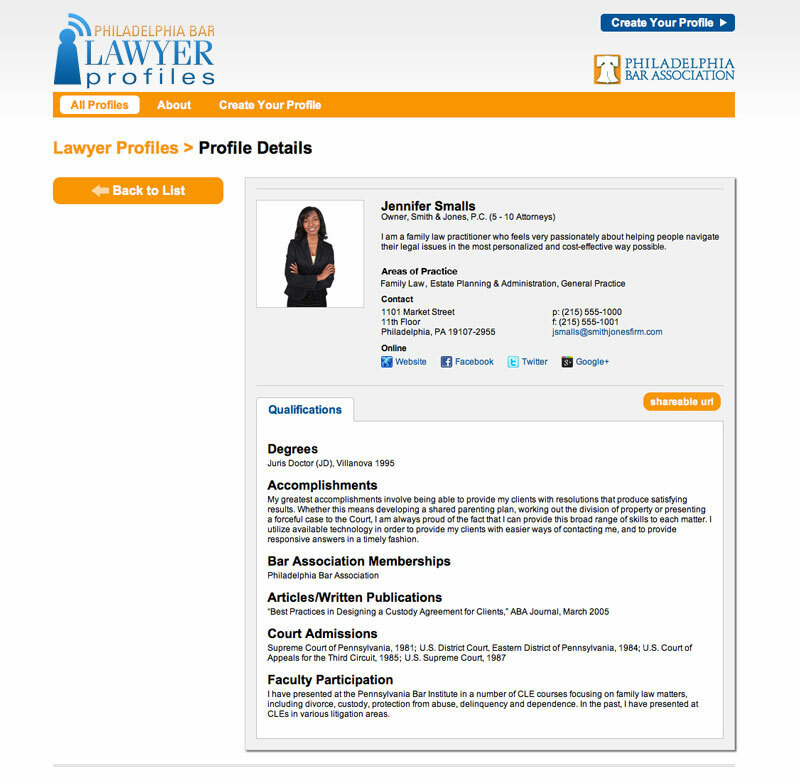 Philadelphia Bar Lawyer Profiles is a new premium advertising opportunity exclusively for members of the Philadelphia Bar Association to help them in their ongoing business development efforts. 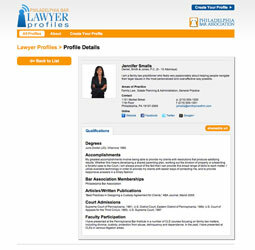 Profile "snapshots" with attorney photo and description are showcased directly on the homepage of the Philadelphia Bar Association website, through random rotation. Snapshots link to the full attorney profile that includes detailed biographical and practice information. 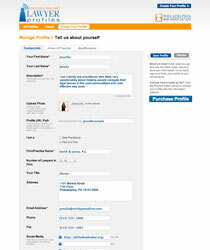 To maintain exclusivity, only 300 profiles are available as part of this unique service. Participants will also receive a customized link to their Lawyer Profiles full-profile page, which they can use for promotion purposes on their personal or firm websites, blogs, social media, publications and other marketing vehicles. This new service adds instant value to your Association membership. Enroll today, and proudly display your professional profile on the website of the oldest association of lawyers in the United States! 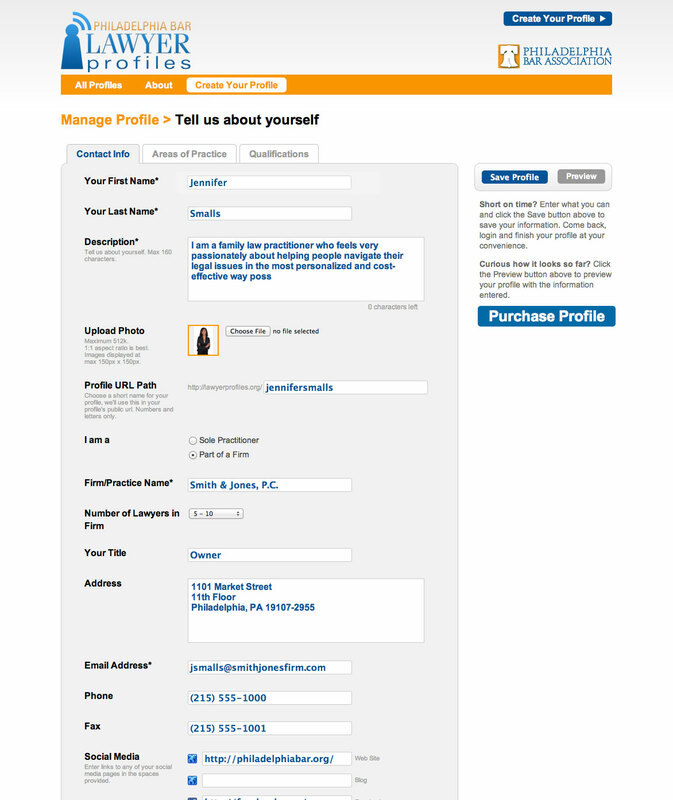 Click on the screen captures below to experience the look of Lawyer Profiles, then click below to get started! In just a few easy steps, you’ll be on your way to creating your very own profile to be seen by colleagues, friends, family and potential clients everywhere. The Philadelphia Bar Association also maintains an award-winning Lawyer Referral and Information Service (LRIS), one of the oldest legal referral services in the United States. For more than 60 years, LRIS has provided referrals and direction to more than one million people in the Philadelphia area. LRIS meets American Bar Association standards for lawyer referral services. 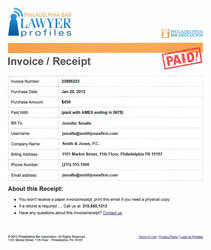 More than 300 attorneys accept referrals in over 150 practice fields through LRIS. LRIS panel attorneys, many of whom are multilingual, are located throughout the Philadelphia region. Your 1st month is FREE. That's 13 months for the price of 12! Very excited about the new @PhilaBar #LawyerProfiles service! 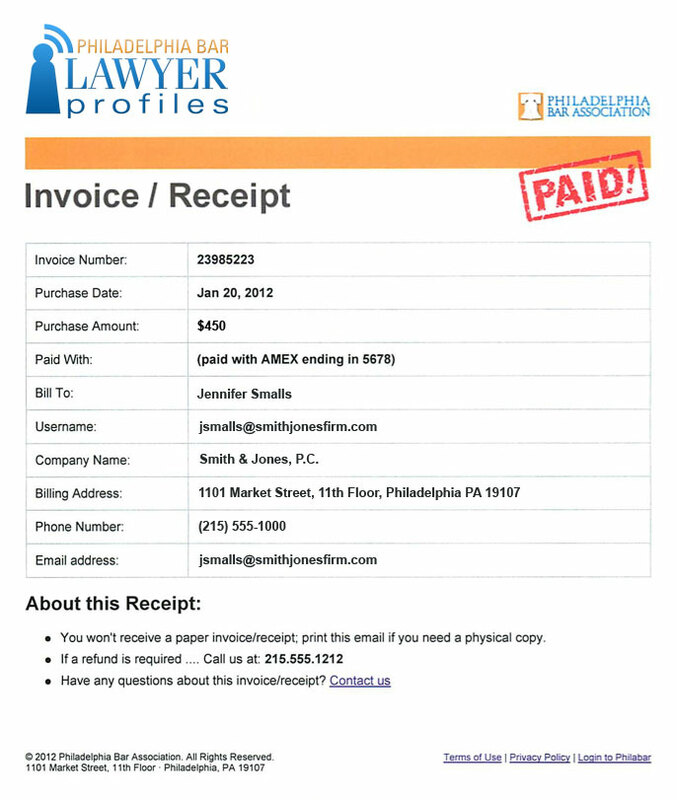 Great online marketing tool for Philly lawyers! Check me out on @PhilaBar's new #LawyerProfiles, launching tomorrow! Looking forward to the launch of @PhilaBar #LawyerProfiles today! 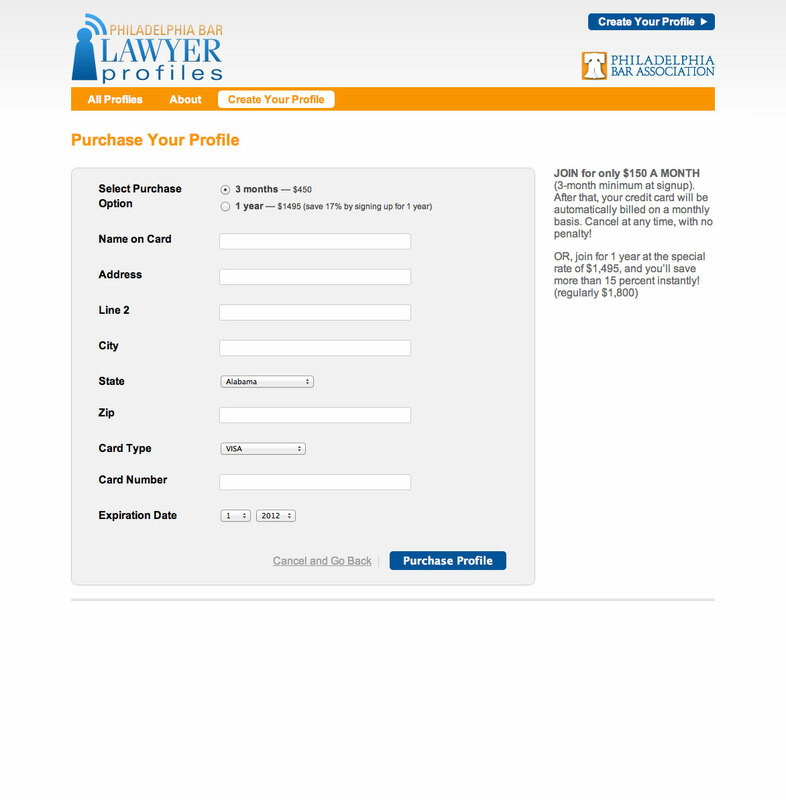 "Lawyer Profiles is generating more calls to my office regarding new business." 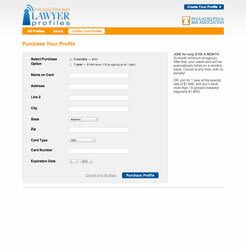 Have questions about purchasing a Lawyer Profile? Contact Lana Ehrlich, Account Manager, at 215-557-2392, or lehrlich@alm.com.